Jemima came to me as an 11-day old nestling, dehydrated, starving and very sick. It was three days before she kept her eyes open, and I had to force-feed her a lot. I think she had been jostled out of the nest, and her parents judged her not worth trying to save. 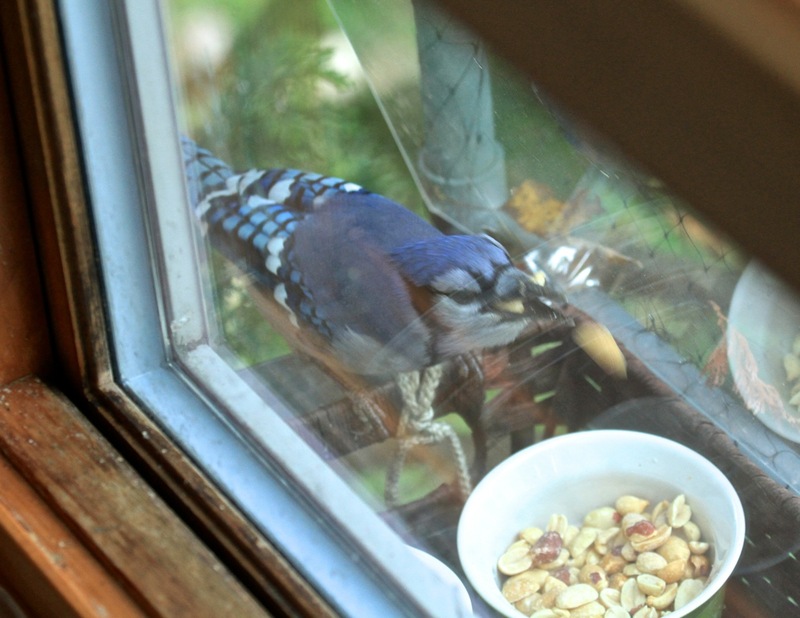 Jays are smart. People like me are dumb. We lead with our hearts. From that period of deprivation, when she went unattended for at least a day, she suffered an interruption in the growth of her flight feathers. And when they reached full length, some of them broke off at the weak spots, which are called fault bars. October 7, 2017. Missing primaries. As a result, this bird is flying on a lot fewer feathers than she should have. 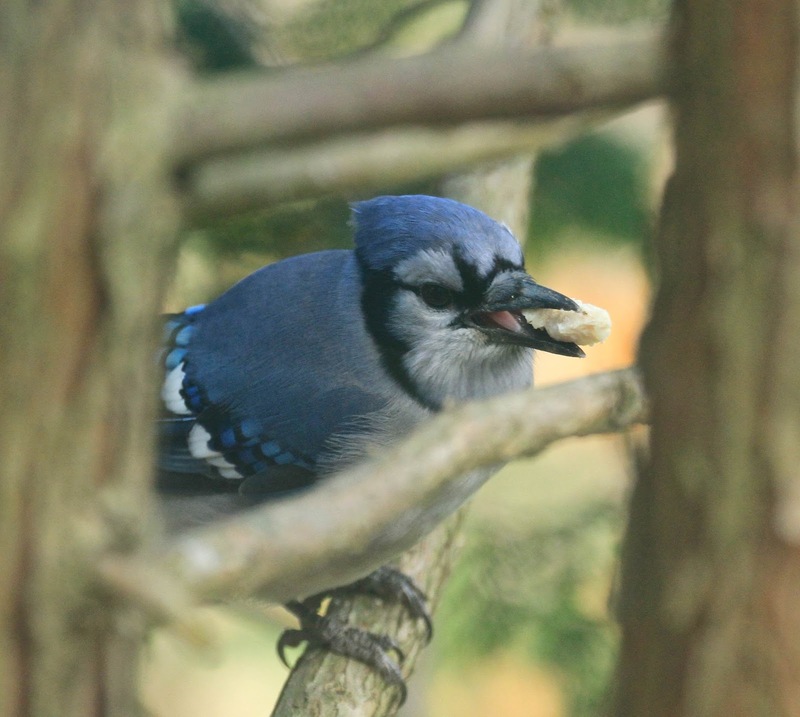 As fate and biology would have it, blue jays retain their juvenile flight feathers until late summer of their second year. She won't molt the broken stubs of her juvenile flight feathers until August 2018. Until then, I pray the ones that remain hold. But there are no guarantees with wild things. More could break off at any time. The fault bars run across all of them. August 2018 is a long time to hold your breath. But you may be sure I am holding my breath. 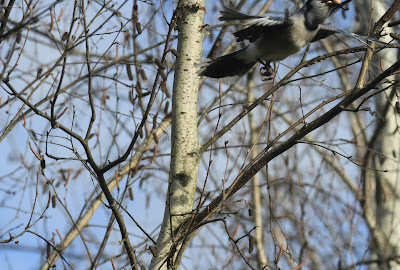 I count on Maybelline and the local winter flock of jays to watch out for Jemima. 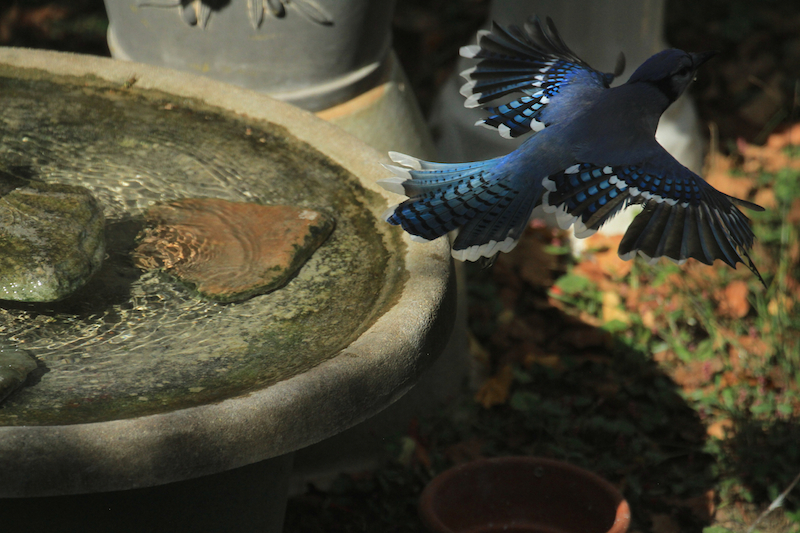 Not much gets past a blue jay. Almost nothing gets past seven of them. Jemima still flies. She flies with difficulty, and she doesn't get much altitude, but she's learned to hop to the top of a tree before she takes off if she needs to cover a lot of open space. That gives her time to look out for hawks before she launches, too. November 11, 2017. Chicken in her grip. I tell her that if she can make it until her feathers molt in, she's going to be a beast among beasts. 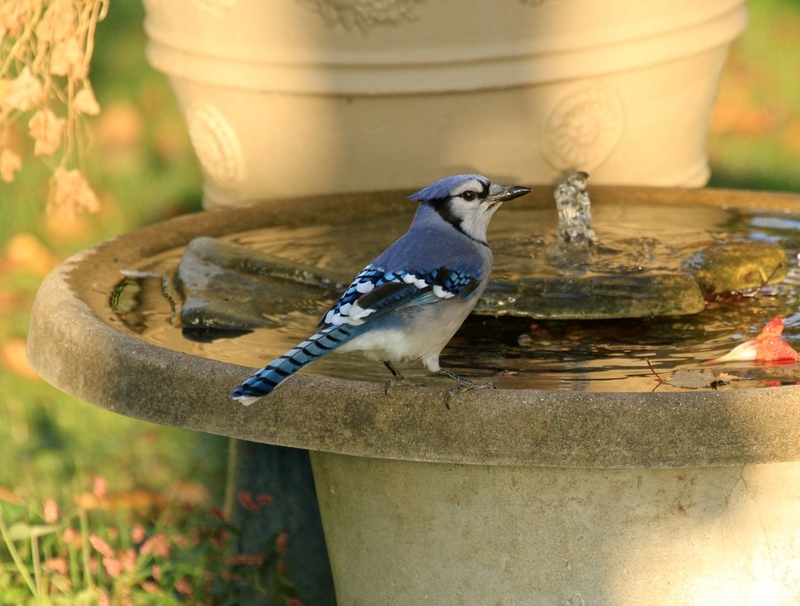 She's going to be the strongest blue jay that ever lived. She already is. I took this photo on October 15. I was outside, and while I stood with my back to the sun, Jemima landed on the Bird Spa, which I keep scrubbed and sparkling and disinfected--for her. I was so close to her that my shadow fell across her. And she turned her back on me and drank. That is trust, and it is as rare in wild birds as rare can be. It's the most beautiful thing I know. She's not sitting on my shoulder any more. But she'll turn her back to me and drink, and if you know anything about how birds think, you know what that means. I won't do anything to betray that beautiful trust. And that would include capturing her to take her in until her feathers molt. Not going to happen. I have been fighting with myself for months about whether to tell you about Jemima's flight feathers, mostly because I didn't want to have to deal with the blowback and handwringing. But I finally decided to. I've come to detest secrets, and to question the necessity of keeping them. So, having told this one, I'd ask that you not pity her. Jemima is tough and strong. She doesn't need sympathy. She needs support, good food, and her flock. I control what I can control. I can give her food and clean water. I never miss a day. Cooked herbed chicken. Pork roast. Pecans, pine nuts. Peanuts. Corn. Sunflower hearts. She gets the good stuff, and I keep it coming. I'm doing everything I can to help her. Know that. Every day I'm privileged to lay out her breakfast is a gift. Every single day she survives, every day I'm granted to watch her interact with her flock and her mate is a gift. It would be stupid of me to wish she had a full set of flight feathers, but of course I do, every damn time I see her fly. And then I smack myself back to reality and say, "It is what it is. Work with it. Tell her story." I didn't see Jemima from November 1-November 9. Her chicken went untouched. Well, almost untouched. 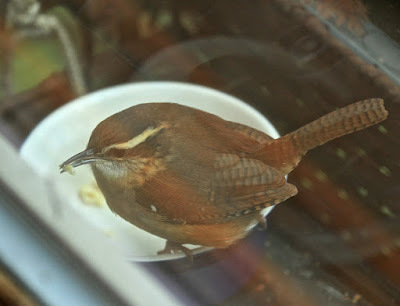 There's a Carolina wren who's developed a taste for chicken. While I worried and imagined the worst about my blue angel, I diverted myself photographing this wee mite stealing Jemima's food. Wren, contemplating the propriety of having eaten bird. omgwhathaveijustdone? Deciding not to feel guilty about it. To have more. It was delish. So you can imagine, not seeing Jemima for 8 days, the kinds of thoughts and fears that coursed through my mind. The conclusions I came to. Maybe she'd tried to migrate after all. No. She knows damn well she can't do that. Maybe that little sharp-shin got her. No. She's as big as he is. She'd fight back. My mind is the devil's playground, most of the time. I've had way more to process lately, to make OK, than I feel I can handle. I melted down on Days 6 and 7, just lost it. I said goodbye to her, too. And having let go (mostly), I was OK on Day 8. I had to move on. What's my choice? No matter what happens to you, moving on is your only choice. hilarious new friend Stephen Andrew Jones says, "Let go, or be dragged." It's my new mantra. More than one person can have the same mantra, right? And then, on the morning of November 9, eight days gone, Jemima plopped onto the Secret Studio Feeder as if she'd never left. She glugged down her chicken and hid about a pound of whole corn and went BOOGABOOGA at the mourning doves and stood down a chipmunk and was completely herself and most of all HERE. Alive. Jemima was not dead. NOT DEAD!! Trying and failing to get Peanut # 7 in her gular pouch for air transport to a secret hiding place in the tangle on the east hill. 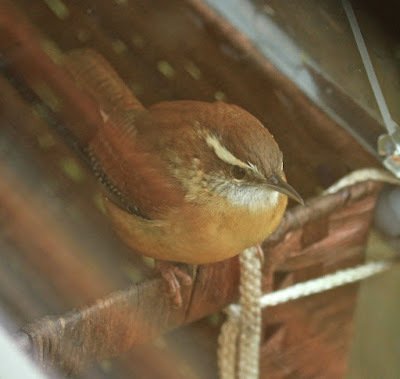 To get there, she flies along the side of the house and up to a telephone line. Re-adjusts the peanut load, then launches on a sustained flight that's easily 130' diagonally across the meadow. Not that I just went out and neurotically paced it off, or anything. Who'd do something like that? My point is, Jemima is making her way. Whether or not she's aeronautically sound or even "releasable" matters not. She's out there, released since June 11, and she's playing the hand she's been dealt. Well, aren't we all? I've told beautiful Maybelline to keep watch over Jemima, and he says he will. He wishes she would share some of that chicken. I tell him to help himself! He answers that he's still working up the courage. But sitting two feet from me through a pane of glass is a very good start, Maybelline! Jem and Maybelline hung around like dirty shirts Nov. 9-12. And then didn't show up Nov. 16 or 17. I'm waiting it out again. Trying not to obsess. 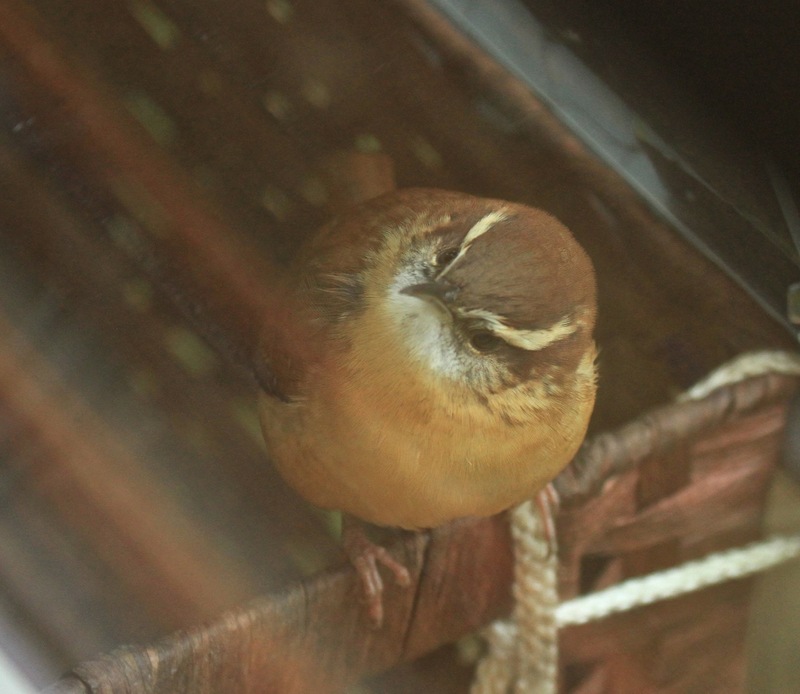 I'm not good at not obsessing about this bird. So. Know that this situation is hard for me, know that I'm doing the best I can by her, and please consider that in your comments and suggestions. I believe in this bird, and you should, too. No pity. No sympathy. And most of all, no handwringing! I can sit here and wring my hands dry, completely unassisted. You'd be amazed how good I am at it. Send us your positivity and strength. Please save the rest. If a hawk takes her tomorrow, hers is still going to be a hell of a story. I've told you about 10% of it. The rest will be in the book. Just before Jem showed back up, I signed a contract with Houghton Mifflin Harcourt to tell her amazing story. Because I was still in the middle of my JEMIMA'S DEAD!!! meltdown, it didn't really hit me until the next day how lucky I am to be able to do that. How lucky can you get? 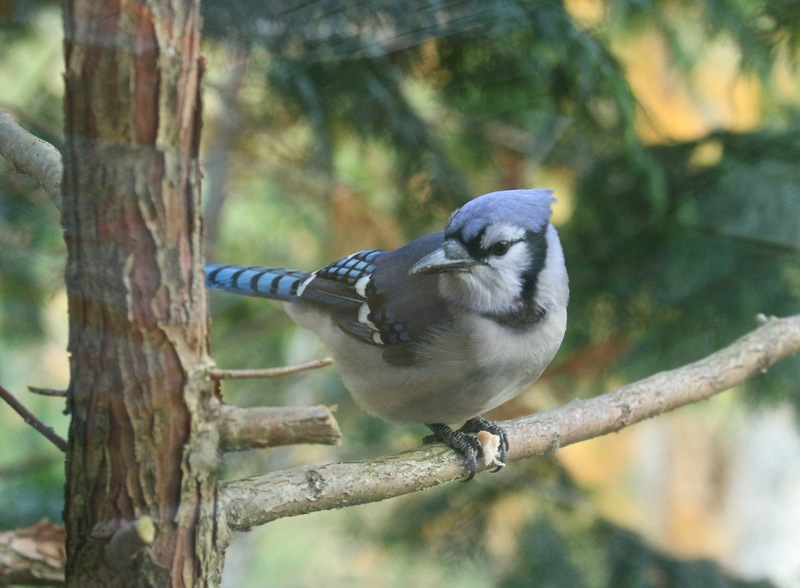 A publisher is waiting for your illustrated book about a blue jay? 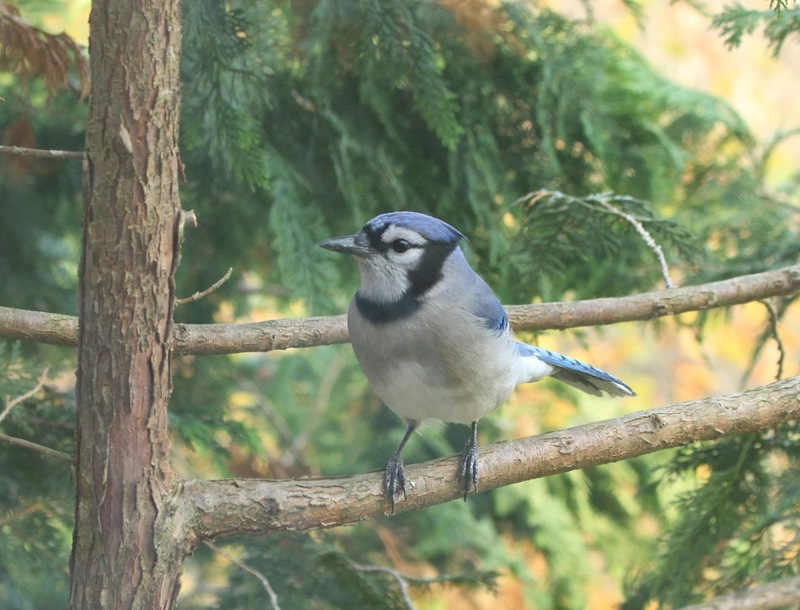 You get to write about, photograph and paint blue jays now? For a living?? Really, though, as if not having a contract would stop me...nothing could stop me, because Jemima has become My Thing. Saving Jemima. Houghton Mifflin Harcourt. October 2019. Be there. November 11, 2017. Full as a tick. She's not fat. She's big-boned. Love it. Love her. Love your words and your pictures. And praying she hangs in there until next August. And very much looking forward to this new book. What a wonderful progress report! Happy to hear she has a companion to over-winter with and continues to visit you. The book will be a great read, I can tell! When I first had my Jackdaw at the U of Bochum, Prof. Curio, a Lorenz student, warned me about exactly this feather problem, and in Jackdaws, who are much more adventurous fliers than Jays, it seemed even more problematic. We were lucky and it did not happen. 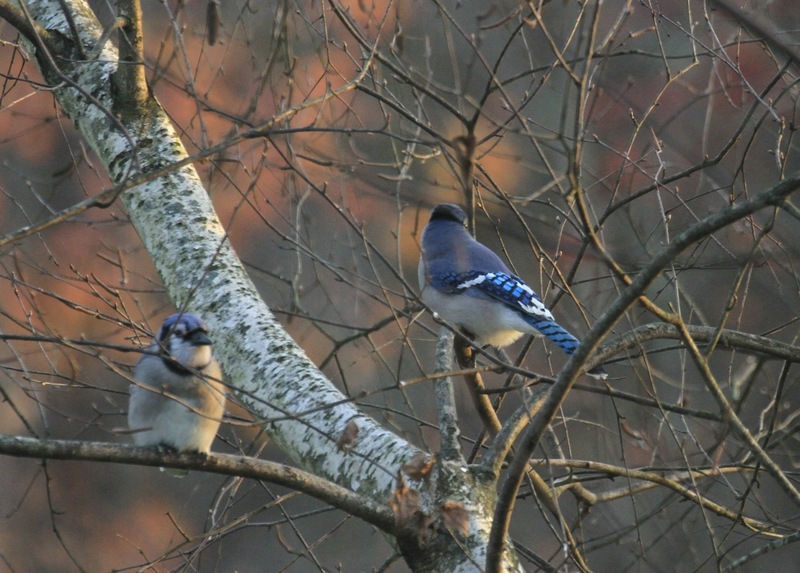 But Corvids are extremely adaptable and Jays can get along for a very long time without full flight ability because they normally aren't soaring over fields like some of their black relatives. I've watched a wild, handicapped Mexican Jay here in Arizona for months, with her partner and flock, around a feeding area and she may have recovered in the end. Yay! Yay! Yay! Go Jemima! Leggoorbedragged!!! Love. Reminds me of the time I was at a friend's house when he was having his Fat Acceptance Group over, and one woman had just finished saying "I've always been big-boned." My friend, well under his breath: "Yeah. Big, jiggly bones." Many, many good thoughts going out for Jemima and her flock. And an internet (((hug))) for you. Yay! Congrats on the book contract. Can't wait to buy the book! I always learn so much from you! Didn't know about the flight feathers thing; now I do. Didn't know they form mating bonds so young; now I do. I think Jemima's book is one I'll HAVE to buy; hmmm, my husband's birthday is in October. That's a good excuse! Your love for this bird and seemingly many wild critters is so inspiring to me. Thank you! Go, Julie! 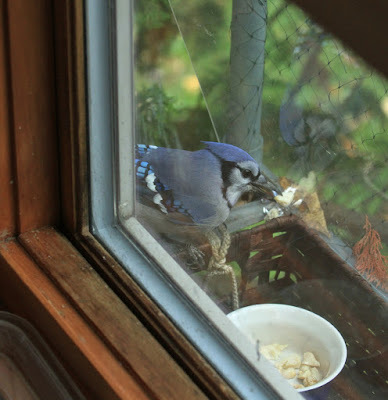 Congratulations on the book deal and on Jemima, hey, you raised and released a blue jay. She came to you with compromises, you made the best of what you had and she is smart enough to figure out how to deal with her shortcomings. AND she has you in her corner to give her that edge. Only encouragement and the best always! This blue jay has so many positives on her side that I am sure she will overcome the flight feather issue. Remember she knows no other way to fly so she isn't handicapped in a way humans imagine. Jemima WILL be victorious!!!! How do I know??? I have a painted bridge that says so! Please let us know as soon as they're back so we can all sleep at night. Since Maybelline isn't coming around looking for Jemima, I'm thinking they are out exploring together and are OK. Can't wait for your book. Love the feather lesson. Dear Julie, you have such an amazing heart. And your story-telling is captivating. Thanks for the latest update, and I send positivity and lots of strength. Jem is a survivor and I'm thrilled Maybelline is part of her life. Can't wait for the book. Very exciting! Yay! for you, and Jay! for Jemima! The saga of Jemima will make a fascinating, fun, and never-done-before book. What a thrill for you and everyone who has followed her story on Facebook. Sorry to say it, though, she IS fat...lol. Wonder where they go... Not handwringing, just curious. First blue jay at our feeders arrived last summer. 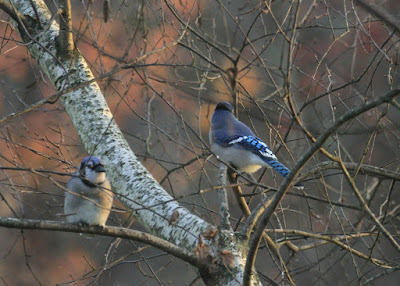 There are two Jemina jays now. So glad that you will publish her story. Your work makes my heart soar. Hugs. Go JEMIMA!!!!! She is a superstar and so are you for saving her! Congrats on the book deal... Her story definitely needs to be shared! 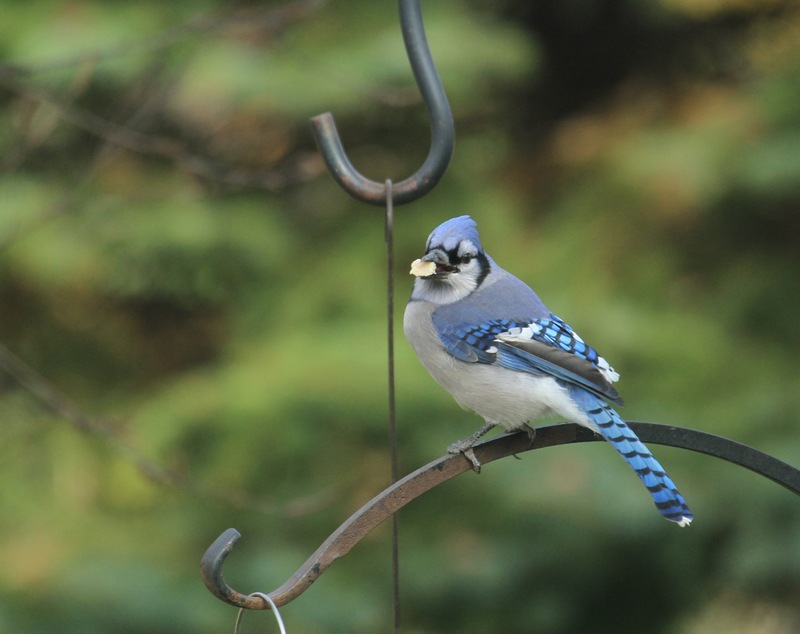 I have always liked blue jays, but Jemima has made me see them with new eyes. I think of her when they occasionally land on my fire escape in NYC and when they gobble sunflower seeds in my parents´ backyard in the suburbs. I had no clue of her feather issue, but it makes her story even more extraordinary. I remember last spring when she got drenched in her water bowl outside and you scooped her up. The picture of a soaked Jemima in your kitchen and the caption about her being a work in progress was priceless. Nothing holds this girl back. Even with a disability she is strong, beautiful, and capable of some flight--all with a hunky blue jay boyfriend at her side! It must be difficult to love a wild bird because they take a little bit of your heart each time they fly away. Just know that Jemima is already immortal. She will live forever in all your readers´ hearts. We all need our flock to be strong right? So amazing to know this piece of Jemima’s story. I cannot wait for the whole tale! That’s such wonderful news. Sending you all sorts of positivity. I promise that my future tears will be tears of happiness and joy. Cross my heart, hope to fly (with Jemima in the sky. Now, isn't that better?) Much love.